How do I Integrate With Stripe Payment Services? Stripe is a transparent online payment system that allows individuals and businesses to accept credit card payments over the Internet . 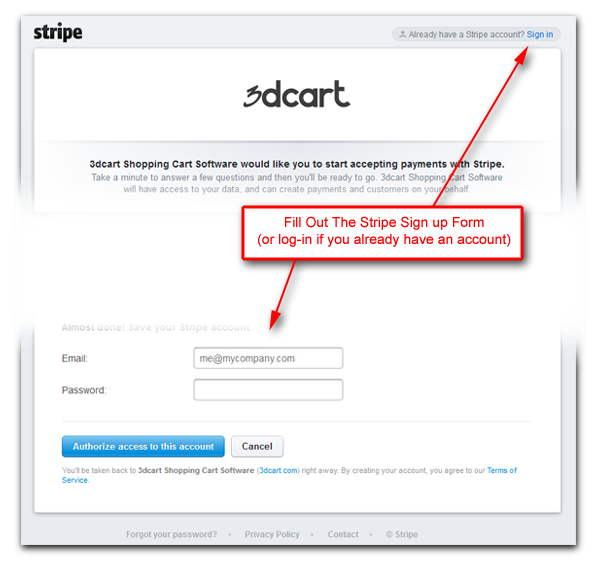 This article will show how to easily integrate the Stripe Online Payment Sytstem to your 3dcart Powered Online Store. Stripe is currently available for merchant payments in the US, UK, Canada, and Ireland with many other international areas in the works! Click here for more information on their current global solutions. In the Payment Method Drop Down menu, look for and select "Stripe"
Next, we'll connect your store to the Stripe Service. Click on the "Connect with Stripe" button as shown. You will then be taken to a sign up form on Stripe's service requesting authorization to connect to your 3dcart store to your Stripe account. At this point, you can either create an account for yourself on Stripe, or - if you already have a Stripe account - log into your account to allow the connection. Creating an account with Stripe is quick and easy and is available instanly upon signing up. Stripe's service is charged on a per transaction basis with no monthly, setup, or validation fees. Click here for more information about Stripe's pricing structure. After authorizing the connection, your 3dcart store will automatically be connected to your stripe account, and you can begin accepting payments instantly! If you are already logged into your Stripe account before clicking the "Connect with Stripe" button (see step 8), then you will not be directed to the sign up/login form at all. Stripe will automatically be connected to your store instantly. Once the Stripe Module is connected to your store, you may proceed with configuring the rest of the Stripe module in your 3dcart store. Click on the Caption Link to change the display name that is used for the payment method on your store front. Click on this link to set regions that will be excluded for this payment method. For example, if you want to prevent the payment method from appearing for certain geographical locations, you would add those places to the exclude list. Use this checkbox to place the payment method into Test Mode, which allows you to place test orders without actually charging the card. Use this checkbox to use Stripe's tokenization options which will allow your shopper's credit card information to be saved on their account for future transactions. Use this checkbox to set the payment method to Authorize Only, which will allow you to collect payment on the order after it is processed and shopped. Click here for more information. If you have customizations to your checkout templates prior to version 8.3 of the 3dcart software, please be sure to update them to the latest version in order to use Stripe JS on your site. If you need to disconnect your store from the Stripe service, simply click the "Powered by Stripe" button shown below.